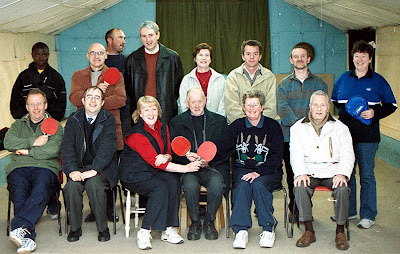 The members of Dundrum Table Tennis Club would like to acknowledge and pay tribute to our founder member and President, Joe Tansey Daly, who died on Tuesday 16th Feb 2010. Joe would have been ninety years old in just a few weeks time. The Social Club was founded by Joe and Seamus Kane with a few other friends, way back around 1945. The cycling club Orwell Wheelers and the Table Tennis club all met in the old premises beside Simpsons Hospital. We played league matches there two nights a week, against some of the best players in Dublin. I have a lot to thank Joe for, he taught me all he could about playing matches. I still hear him giving me advice when I’m playing! The club is still going strong, and now meets in the GAA club in Stillorgan Industrial Park. We will do our best Joe, to keep it going for another 50 years! 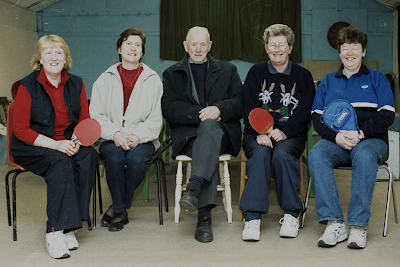 Pat O’Kane, Secretary Dundrum Table Tennis Club, and all the members. Joe with club members in the old clubhouse. Joe with some of the ladies.